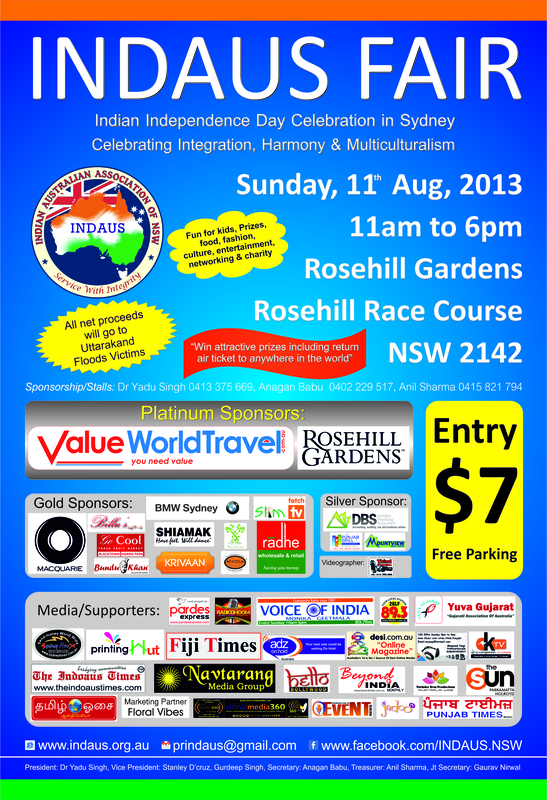 INDAUS FAIR, Sunday, 11th Aug, 2013, Rosehill Race Course, Rosehill, NSW! This entry was posted in Dr Yadu Singh, Indian Australian Association of NSW Inc, Indian Community Events, Sydney, Indian community leadership in Sydney and tagged Dr Yadu Singh, INDAUS FAIR 2013, IndAus Inc, Indian Australian Association of NSW Inc, Proceeds going to Uttarakhand flood victims, Rosehill Race Course, Sunday 11th Aug 2013, Uttarakhand Flood, Western Sydney major event. Bookmark the permalink. ← All nett proceeds from INDAUS Fair on Sunday, 11th Aug, 2013 going to Uttarakhand Flood Victims!